scalloped squash + such | eating with S.O.L.E. I was craving scalloped potatoes the other day, and as I still haven’t dug my potatoes out yet I decided to make a hybrid harvest spin on the comfort food I was aching for. I used rich nutty chickpea flour to create a thick garlic sauce to ooze into the layers of squash, onions, rainbow chard and carrots. I picked up a few packs of really amazing goat feta the other day and blended that with blanched chard to create a couple lasagna inspired layers in this dish. As I was making it I was reminded of that killer vegan cashew “cheese sauce” I made a while back, and how easily that could be used to make this dish both vegan and gluten free!Start with a meaty and dense squash, something large-ish, peel it and half it, remove seeds and cut into 1/4″ thick slices. season with S+P and set aside. In a large pan using nice oilive oil satay the stocks of about 10 swiss chard leaves, along with 3 medium onions and a few cloves of garlic, all chopped up nicely. Once the onion is just browning remove from heat. In a medium pan melt a knob of butter (or vegans skip this step and rock out that cashew sauce) add a couple tbsp of chickpea flour and start cooking down a roux. Season with freshly grated nutmeg, garlic powder, and dried mustard. Thicken with 2 cups of farm fresh raw milk, and stir vigorously until sauce is thick and lovely, season to taste with S+P. Blanch swiss chard leaves for 2-3 minutes, strain and set aside. Chop chard leaves and combine with 1.5 cups of fresh feta. season with S+P, chilli flakes and fresh parsley. 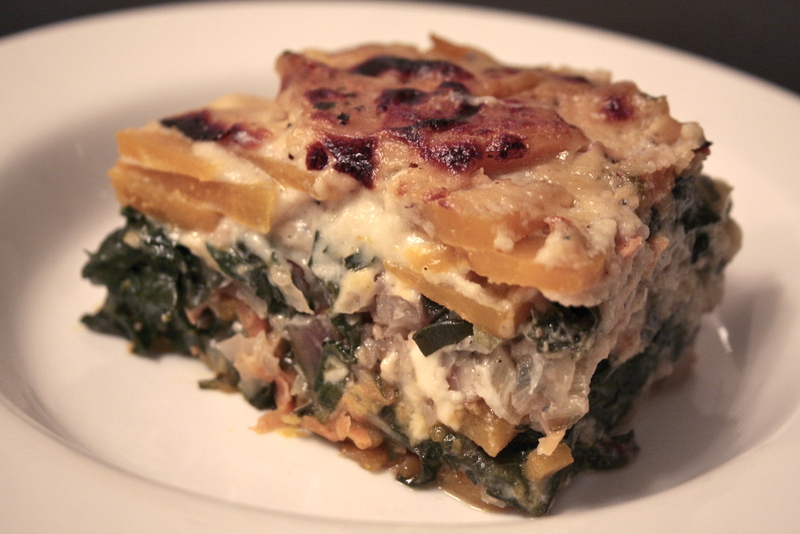 Layer squash pieces to cover two layers on the bottom, then layer the onion mixture over top, pour a little galic sauce over the lot then cover that with a layer of chard and feta, then a thin layer of grated carrot, back to the squash and repeat. Your top layer should be squash then the rest of the garlic sauce. Bake at 385 for about 40 minutes, and when you can easily cut through the squash layers with a sharp knife, then set the over to broil and brown the top. Let sit to set up for at least 5/10 minutes before serving as it will be crazy volcano hot! now enjoy in front of the fire.